The human hair triangle mustache (often referred to as a pyramidal mustache) is a basic shape that has been around for ages. It is narrow at the top towards the nose and then widens out as it goes down to the mouth creating a triangle shape with the nose as the point and the mustache as the base. This mustache is available in a range of different colors. This is the Human hair version and gives you the most realistic look and allows you to use any hair product including dyes that you can use on natural hair. The hair is attached to a full lace backing. Please note that this item requires spirit gum to apply, we recommend our spirit gum and remover combo pack. 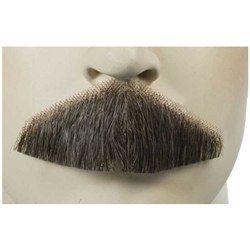 This mustache is extremely realistic and superb for stage, video, film and close-up work.